The recent heatwave has had a devastating impact across the globe. Abnormally high temperatures and a lack of rainfall have led to drought conditions and a spate of forest fires across Europe, even in the Arctic Circle. The Greek government declared a state of emergency last week as the spread of wildfires killed at least 80 people, including an Irish man on his honeymoon in the coastal town of Mati. A 38,500 hectares (95,000 acres) wildfire in California has also claimed the lives of at least six people. We have been lucky in Ireland to escape any loss of life as recent weeks have seen significant fire activity, with an Extreme Fire Risk warming in place for much of June and the first half of July. Based on an analysis of data from fire services across the country, The Green News can reveal that firefighters have attended at least 2,257 bog, gorse, grass, and forest fires since the start of June alone. The average annual number of fire incidents between 2000 and 2016 stands at just over 3,400. The data for summer 2018 is conservative as several fire services were only able to provide data for the month of June and a few counties – Fermanagh, Kilkenny, Galway, Laois, Louth, and Roscommon – did not provide figures. The fire services in Northern Ireland have responded to a further 1,972 fires, according to the Northern Ireland Fire & Rescue Service. The data received by The Green News paints a clear image of the wave of fires that have hit the country since the start of the summer, with Dublin alone dealing with 648 incidents. The Dublin Fire Brigade said that the situation in June and July was deemed “high risk” as the extended period of dry hot weather “significantly” increased the risk of fire incidents. In Cork, 21 fire stations responded to 293 incidents, 161 of which were gorse fires, 115 grass and 17 related to incidents in forested areas. This figure does not cover the perimeter area around Cork City which is covered by two stations in Ireland’s second city. Limerick faced 179 incidents of vegetation fires. Earlier this month, a large gorse fire atop Nicker Hill raged for five hours before fire crews were able to get it under control. Wicklow tackled 132 wildfires in June alone, with the county’s fire service expecting more before the end of the summer, particularly in the mountains. Several fires overwhelmed the mountainside in June, including two large bog fires near Lough Bray and in the Sally Gap. “Crews are being provided with rest periods and sufficient resources are maintained in towns to deal with other incident types,” the county’s chief fire officer, Aidan Dempsey told The Green News. Waterford has dealt with 112 wildfires since the start of June, with chief fire officer, Niall Curtin, telling us that there was “no signification reduction in risk” during the entire month. “Although busy, Waterford Fire Service is structured to handle these situations while providing cover for other emergency incidents in the community,” he added. 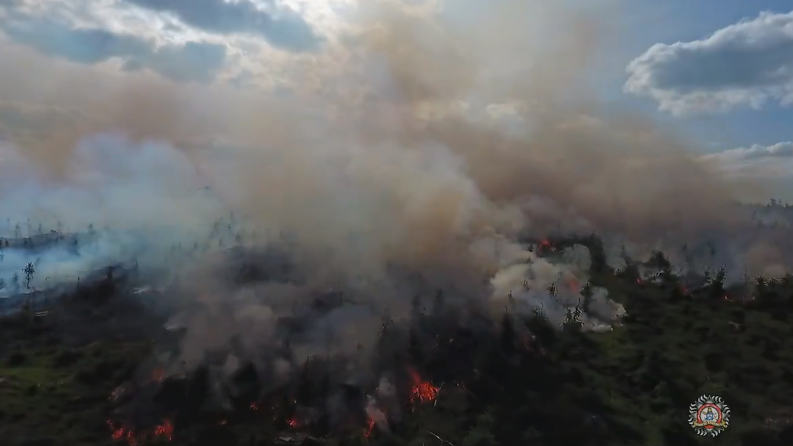 Kildare Fire Service attended 130 incidents of forest, bog and grass fires from the start of June until 19 July, while Wexford has seen 116 fires since the start of June, with Paul L`Estrange, the chief fire officer, expecting more this summer. “Our resources have coped with the incidents we have had to date,” he said. Beachgoers were lucky to escape a large fire earlier this month that engulfed over 13 acres at Curracloe beach. The fire services in Donegal responded to 105 wildfires between 1 June and 10 July, with their resources impacted by the blazes. “Fire Service resources are not immediately available to respond to other requests for assistance where there is a risk to life such as road traffic collisions and house fires,” a spokesperson from Donegal County Council said. Resources in Carlow were also “severely” affected by 84 forest, bog and grass fires during June, according to Alan O’Neill, fire officer with Carlow Fire & Rescue. He said that both “fatigue” and “exposure to risk” are up, while fires have led to a financial cost “not normal for this period”. Data released to Birdwatch Ireland under Freedom of Information regulations revealed that ten counties spent over €6 million to tackle 5,889 gorse, forest and bog fires between 2010-2015. Clare Fire and Rescue Service has attended 69 wildfires since the start of June, a high figure compared to the four fires attended in June 2017. “The high number of gorse fires is putting additional demands on our resources but they are not overstretched,” a council spokesperson said. In Kerry, there have been at least 68 fires, with a further 57 in Tipperary and 23 in Westmeath. “If the current dry spell continues, then it’s expected that we will be dealing with an increase in operational activity,” a spokesperson from Westmeath County Council said, with water restrictions also impacting the fire service’s work. In Sligo, 23 fires have been dealt with, as well as 17 in Longford and 11 in Leitrim. Although Monaghan has seen only 13 wildfires, chief fire officer, Dermot Brannigan, told The Green News that several gorse fires have been “very labour and equipment intensive” and required “significant interaction” with farmers and plant operators. Since the start of July, there have been at least nine callouts for bog and forest fires in Meath, with crews “busier than usual”, according to the county’s chief fire officer, Sheila Broderick. “We have resilience in our service provision through other brigades in the county… so our resources are adequate to deal with these incidents at present,” she said. Cavan has faced six “isolated small incidents” but encourages “the public to be mindful of the risk of outdoor fires,” a council spokesperson said. The fire services in Mayo attended a total of 59 wildfires from the start of June, while Offaly dealt with 17 fires, including major fires in the Slieve Bloom Mountains and another in Barna. The fire in Slieve Bloom started close to an important blanket bog and a habitat for the endangered Hen Harrier.